Friciana VIII, no. 47: 3- 15 (1972); cf. Rowley in Repert. Pl. Succ. (I. O. S.). 23: 7 (1972 publ. 1974). Habitat: They grows among rocks exposed to full sun or (usually) in semi-shade under small bushes and between grass, or moss, with no presence of other cacti. The climate is subtropical and warm near all the year. During the winter the temperatures could go down until 2º C, but the dark rocks act as an accumulator, keeping the plants at a little higher temperature, forming a special microclimate. Echinocactus denudatus var. roseiflorus Hildm. ex K.Schum. Gymnocalycium denudatum var. fleischerianum hort. 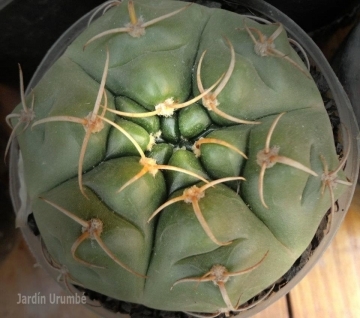 Description: Gymnocalycium paraguayense is an extremly variable species from Paraguay at first solitary slowly forming in age large groups with 20-30 heads. In a single population, you can find all forms of plants with different number, form and length of spines, number and form of ribs etc, and, but for the red throat of the flower, some forms (syn. Gymnocalycium fleischerianum) could be confused with Gymnocalycium horstii. However, in its normal form, it cannot be confused. Stem: Spherical more or less flattened up to 4-5 cm tall and 5-8(-12) cm in diameter, eventually becoming shortly columnar, pale to glossy mid-green tending to bronze in full sun. The more shaded growing plants seem to get bigger with a less tendency to branch. Ribs: (5-)8-9(-12) or more, straight, angular, divided into more or less noticeable tubercles by well-defined transverse furrows, the tubercles have a protruding chin just below to the areole. Radial spines: Usually 3 to 9 (mostly 5), unequal, upper spine(s) about 1 cm long, remainder 1-3,5 cm (rarely up to 6 cm) long, outspreading, somewhat curved and adpressed, honey-yellow or pale-brownish at first, fading to white or greyish. Flowers: Funnel-shaped, dioecious, 4-5(-6) cm long and wide, white with deep pink or wine-red throat (infrequently entirely white). Pericarpel 1-2 cm long, olive green with imbricated scales that are reddish at their tips. Style and stigma are white, stamens pink or whitish and the pollen is yellowish. Fruit: Almost spherical, pera shaped or shortly club-shaped, up to 1,5 cm long, softening but not splitting when ripe. Seeds: Large and oval, noticeably broader toward the aril, approx. 1-1,5 mm in diameter, dark brown to black. 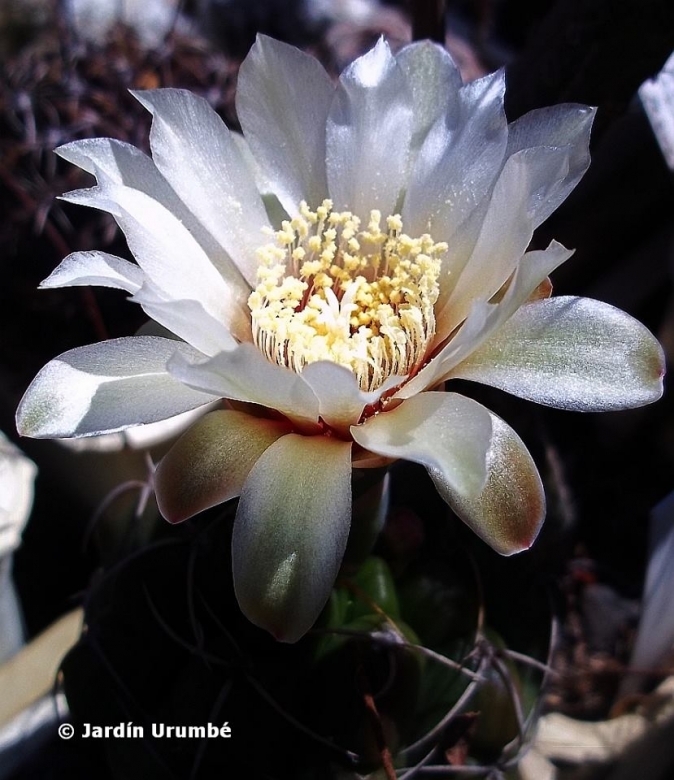 Accurarated systematics studies based on macromorphology, micromorphology and molecular (RAPD methods), have shown that Gymnocalycium paraguayense (K. Schum.) Hosseus and Gymnocalycium fleischerianum Backeb. 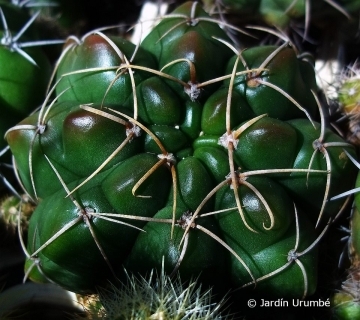 (Cactaceae), previously considered as two different species, resulted to be very homogeneous and suggest that all populations should be referred to a single species, composed of two taxa at forma rank. The furrow on the rib between areoles is the main diagnostic character to separate G. paraguayense from G. fleischerianum. However in habitat plants revealed a high intra- and interpopulation level of variability, so that usually only the furrow on the ribs allowed the taxa to be separated; however, in a few single plants even this character is not reliable. Often the plants attributed to G. paraguayense grow in less shallow soil and have a rather flat stem, while those referred to G. fleischerianum are found in shallow soil at the margin of rocky outcrops, where they have a more rounded stem. The general aspect of the plants from each population is usually more or less characteristic. Gymnocalycium paraguayense (Mundt) Schütz & Moser: (f. paraguayense) has 8-9 ribs divided into noticeable tubercles and 3 to 9 (mostly 5) radial spines. It is an extremly variable species. Furrow on the rib between areoles present. Gymnocalycium paraguayense f. fleischerianum (F.Haage) Mereg., D.Metzing & R.Kiesling: It has more spines (up to 9 or more per areole), somewhat curved and close to the often rounder body. Furrow on the rib between areoles absent. Gymnocalycium vieditzianum Piltz: It distinguish for the grey-bronzed epidermis and shallow tubercles; It has typically 5 spines. 2) David Hunt, Nigel Taylor “The New Cactus Lexicon” DH Books, 2006 ISBN 0953813444, 9780953813445. 4) Edward F. Anderson : “Das große Kakteen-Lexikon” Eugen Ulmer KG, Stuttgart 2005 (übersetzt von Urs Eggli), ISBN 3-8001-4573-1 , S. 323. 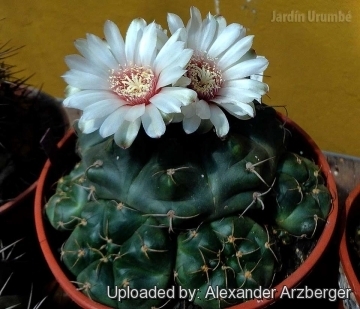 5) Detlev Metzing: “Gymnocalycium paraguayense (K. Schumann) Hosseus” In: Kakteen und andere Sukkulenten . Band 62, Nummer 5, 2011, S. XIXf. 7) Archivos de la Escuela de Farmacia de la Facultad de Ciencias Medicas de Cordoba . Band 9, 1939, S. 106. Cultivation and Propagation: Gymnocalycium paraguayense is a summer grower species that is easy to cultivate. Soils: It likes very porous standard cactus mix soil. pH neutral or acidic, avoid substrata rich in limestone. Hardiness: Reputedly somewhat resistant to frost if kept on the dry side prior to, and during, cold weather (hardy to -5 C ° C, or less for short periods).